Dope-seeds Auto Diesel is an autoflowering version of the powerful NYCD strain and is no less impressive than its photoperiod parent. 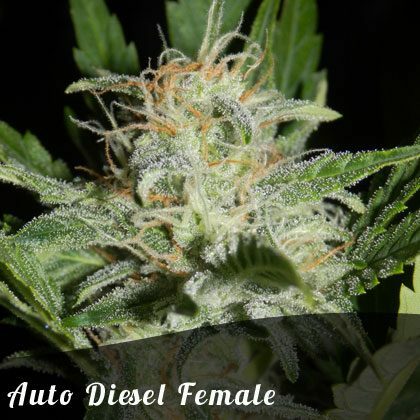 Auto diesel is a sativa dominant autoflowering cannabis strain which goes from seed to but in 10 weeks and can produce yields of 2-3 ounces per plant if properly cared for. Auto Diesel is a 100% auto flowering version of the famous New York City Diesel cannabis strain. This means that regardless of hours of light this strain will begin to flower after around 3 weeks from sprouting and will have completed its flowering cycle and be ready for harvest in around 10 weeks. Auto Diesel was created by crossing NYCD with our autoflowering line and then inbreeding until we had 100% autoflowering offspring. The resulting strain is very potent, sativa dominant auto with an uplifting cerebral high. The original NYCD strain was produced by the legendary breeder Soma in Amsterdam in the 1990’s and was said to have sour diesel, Afghan and Hawaiian genetics. NYCD is famous for its fuel-like aroma, its uplifting effect and its high resin production and its autoflowering sister is no different. Auto diesel often produces multiple branches so there are many bud sites and it’s a good strain for SOG or SCROG setups. Auto diesel is very easy to grow and you can expect yields of 2-3 ounces per plant (60-90g) with the height rarely exceeding 100cm. As the name suggests NYCD gives off a very strong aroma in the grow room so if ventilation is an issue it might not be the best strain but if you can grow her outdoors then she really produces the goods. Smokers of NYCD say that it’s great for social situations and is a no-paranoia strain that reduces stress and counters depression. All in all auto-diesel is a very nice auto strain which deserves a place in everyone’s genetic collection.